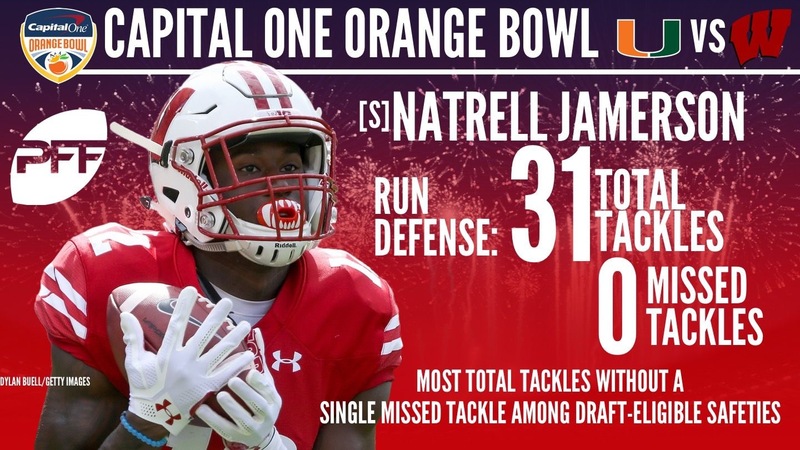 Miami, Florida: The Orange Bowl should be a hard fought game with talent to watch. Sure Wisconsin isn’t Ohio State and Miami isn’t Clemson, but they have their fair share of draft eligible talent. With the help of PFF College, I was able to compile a list of players from each team that I will be keeping an eye on in the Orange Bowl. Fumagalli is not a flashy TE, but he gets the job done. He is asked to block quite often and is considered under utilized, which is evident from his statistics on the season. 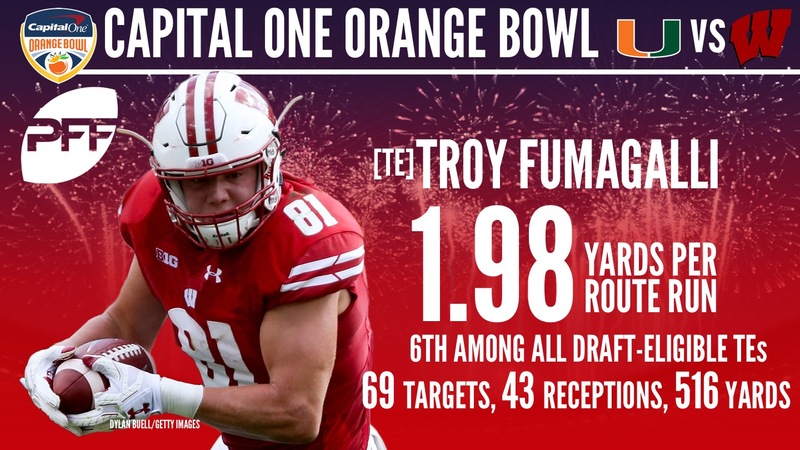 Fumagalli got off to a hot start this year, as he recorded 15 receptions for 216 yards and 3 touchdowns in the first three games of the season. He has been consistently reliable the entire season, but has seen a decline in production. Look for Fumagalli to be relied upon on crucial situations. Jacobs is a versatile linebacker with the ability to play with his hand in the dirt and standing up. He is asked to do a multidude of tasks such as rushing the passer, dropping into coverage, and blitzing from his linebacker position. Jacobs is a guy that caught my eye often while watching film. He finds himself around the football often. Edwards is a mold of an old school style of LB with his size (6’1 244), but not his style of play. He has fantastic coverage ability, evident by his 4 interceptions this season. He only allowed a 40.3 quarterback rating (QBR) when targeted, on 40 targets. (28 rec allowed 0 touch downs). Edwards is a solid linebacker against the run as well and is relied upon as an every down linebacker. Connelly and Edwards compliment each other well. The inside linebackers of Wisconsin are as solid as they come. Connelly is not as good in coverage as Edwards, but he has improved this season. He is a very effective blitzer and his showed the ability to get after the QB with 16 pressures on 52 pass rush attempts. Jamerson lives up to the name “safety” as he is a very efficient tackler from the safety position. No draft eligible safety has been more efficient than Jamerson. Non of this should be surprising, since the Defensive Coordinator is former NFL Safety, Jim Leonhard. Jameson plays similar to Leonard, which is fast and hard. He gets to the ball carrier in a hurry. Berrios is more of a slot reciever, but guys like Edelman, Jarvis Landry, and Cole Beasley, have all shown how important having a shifty WR is. Berrios is in the mold of all of those guys. Berrios is a good return man, using his shiftiness to make defenders miss. 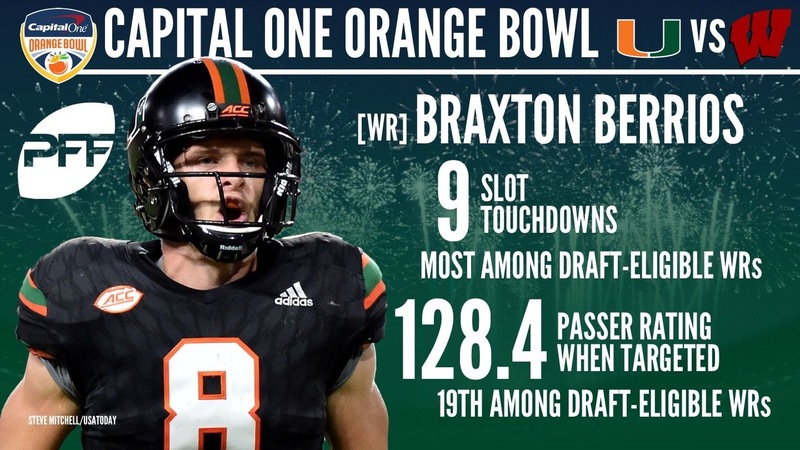 No wide receiver in college has more touch downs from the slot than Braxton Berrios. QBs are recording a 128.4 QBR when targeting Berrios. (19th among draft eligible wide receivers). McIntosh is a force on the interior of the Miami defensive line. He causes problems for opposing OL every week. McIntosh has decent size 6’4 293, but plays will explosive ability and power. He has recorded 49 tackles 26 quarter back pressures, 12.5 tackles for a loss and 2.5 sacks this season. Simply put, McIntosh is a force on the Hurricane defense. Chad Thomas has been a force on the Miami defensive line, recording 10.5 tackles for loss and 4.5 sacks this season. The 6’6 275 senior has the NFL size and ability to play at the next level. 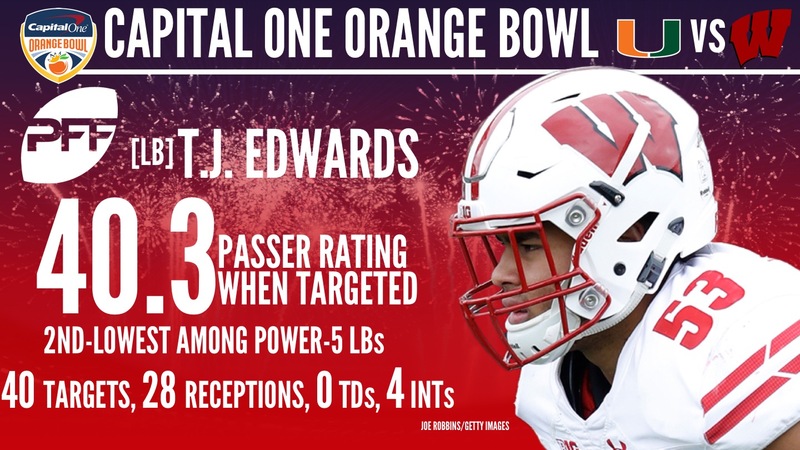 Thomas’s stock could rise greatly with a good bowl game showing, against an elite OL. Trent Harris is smaller than Thomas, at 6’2 248, but is a more of a quick twitch pass rusher. In 2017, Harris recorded three multiple sack games, recording two against, Toledo, Virginia, and Notre Dame. Harris is not as good against the run as Thomas, but has improved this season. Harris looks to improve his stock with a good game against Wisconsin. Jackson has had a fantastic year, only allowing 22 receptions on 45 passes. On those passes, he has intercepted 4 and recorded 4 pass break ups. Jackson has allowed a QBR of 36.1, which is the 6th lowest of all draft eligible cornerbacks. Jackson does a good job of using his length and athleticism to get to the football. Jackson has excelled in his first year as a starter, but it remains unknown if he will return for his senior year or if he will enter the NFL Draft. Both Wisconsin and Miami have draft eligible players to watch. A majority of the prospects are on the defensive side of the ball, making this a defensive battle to watch.